The ACLC Christmas Dinner was a GREAT HIT!!!!!!! From the Pre-Program Christmas Music to the flow of the evening’s program, led by Rev. Fermin Bocanegra and Evangelist Alexis Allen, it was an evening to remember. Rev. Burgi Hutcherson, North Carolina ACLC - Co-Chairman, warmly welcomed all in attendance. Minister Willie Muhammad gave the invocation and Rev. Levy Daugherty, ACLC National Advisor, led the Holy Wine Ceremony. Bob Huneycutt, who lives in Durham and is a member of FFWPU Raleigh, performed original songs written by himself. It is always a pleasure to listen to the music message and have his music by guitar take you places that speak to your spirit. Vonda Gabriel of the Now Faith Holy Church performed a Worship Dance that took us to the gates of the most high, and the instrumental music provided by the Davis family from the CRT Apostolic Church had all attending stomping their feet and clapping their hands. It got better as Evangelist Cynthia Hill of St. John Baptist Church shared her soul and invited us to sing along. Ambassador for Peace Presentations were made by John Pace from Apex, North Carolina. There is an ongoing campaign to extend an invitation to people in our world to become Ambassadors for Peace. It is hoped that the numbers will be greatly increased. Other presentations awarded were the Family Flag, and a very special plaque was given to Bruce and Burgi Hutcherson for the gift of self in service to the work of building God's Kingdom in this world. Burgi, with the support of Bruce, does a tremendous ministry with passion and a heart as BIG as the World. Nobody does it better!!!!!!! For those of us who don't get out much or who maybe don't know what's going on, announcements of upcoming events were shared. A wrap-up of the evening was more fun than you can imagine as Caroline Uyama led the Raffle of Gifts that were won by people whose name was pulled from the basket. Lots of gifts were passed out and many, many, people went home happy. The evening closed with all singing Silent Night, Holy Night. Rev. Ardeal Roseboro of Liberty Grove Baptist Church in Taylorsville, North Carolina, gave the benediction. What do the people have to say about their evening experience? Mary Shelton, a new Ambassador for Peace attending her first function wrote..."I thoroughly enjoyed it. I sure got some spiritual uplifting. I needed the renewal and revival of my spirit! Thanks for having me!" Carolyn Sampson, Ambassador for Peace and Special Assistant to Sharon Pace - AFC/UPF-USA Field Leader reports that it was an awesome evening!!!!!!! She expressed that the fellowship among the people in attendance was up close and personal and generally the best of the best. She was very glad to have attended and have the opportunity to mix and mingle. Pastor Fermin: "The whole event had a family atmosphere with simplicity and personal touch. The people felt at ease and free to express their feelings to each other. It was wonderful how the participants responded spontaneously in love and unity to the guidance of the Holy Spirit." 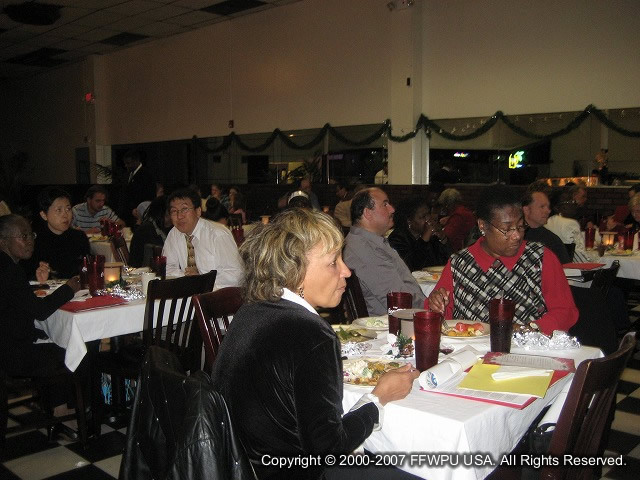 John Pace, Ambassador for Peace and Special Assistant to Sharon Pace - AFC/UPF-USA Field Leader felt that it was a great evening and he was most glad to have been present and accounted for at the annual ACLC Christmas Dinner. He looks forward to next year with greater anticipation!! He was also most happy and honored to present the plaque of appreciation to Bruce and Burgi. Bruce Hutcherson -- It was significant because of the support we received from local ministers, Ambassadors for Peace and Family Federation members. It was the committed people of heart who came. The place was nice, because the Spanish atmosphere took me into a foreign land without the airfare and the food was great and the cost was reasonable. Burgi Hutcherson -- It caught me by total surprise when Pastor Fermin called my husband and me on the stage to receive a plaque for "Heavenly Gratitude" recognizing our couple for many years of service and sacrifice for FFWPU and ACLC. Then Pastor Fermin called key religious leaders to come forward and surround us to pray for our mission and work. It was like all Heaven wanted to lift us up and bless us on our path as tribal messiah. I was honored to find such a heart and unity. Glory to God and True Parents for our lives! The Gift of Heavenly Gratitude goes to them! The Joy of Joining together! Every intelligent man, if he believes in anything, believes in the brotherhood of all men, or at least he has a feeling of humanity. There is no humanity in unnecessary isolation, and there is nothing intelligent about the obsession to remain passé. The only practical solution for a sane society, aspiring for the acceptance of true diversity, is to take a leadership role in efforts to find ways to bridge the divide that has fostered the climate for the intolerable acts of religious intolerance we now are witnessing in the world today. May we all learn that none of us own the factory of complete knowledge and human perfection and much wisdom is still to be learned from each other. The Family Federation continues to advocate the principles of humanitarian cohesiveness and encourages the family of humankind to gather and share ethical values from which we can all benefit from. On Tuesday, December 11th, people from different faiths gathered in Winston-Salem to celebrate our differences and our mutual respect for each other’s differences. We acknowledged that we can exist with both, at the same time, if kindness and human love is the foundation of our relationship. It was joyful and inspiring. The smiles, the words of inspiration, the melodies of joy -- all bore witness to the fact that we live in a multicultural society where there is enough room for all of us and that we need only to venture toward each other to achieve mutual respect and communal harmony. There is a future in this kind of bridge building and connecting of the human spirit. What starts with a meal, ends with a friendship and the wonderful possibilities that we can achieve the kind of brotherhood God has intended for us to create. The ACLC of District 6 wish you all a "Merry Christmas and Happy Holidays"